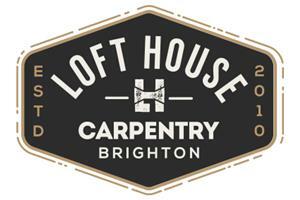 Lofthouse - Builder, Carpenter based in Brighton, East Sussex. Lofthouse brings together father and son to form a partnership that prides itself in quality of workmanship. We are specialist loft-conversion and carpentry experts. With over 30 years' experience in all aspects of Carpentry and Building, Mick and Wills have the knowledge and expertise to accomplish your project to the highest standard. Based in Horsham and Brighton, respectively, we cover West Sussex, East Sussex and Surrey. Recently most of our work has been in either Reigate, Horsham or Brighton. Although focusing on carpentry, loft-conversions and refurbishment's, we undertake all aspects of general building. From hanging a new front door, restoring sash windows, laying a reclaimed wood floor, constructing a new extension, or timber framed out building, our exuberant approach remains the same. When needed we bring together a select team of highly skilled tradespeople to achieve the level of finish and quality that we expect and you deserve. We also bring along our Henry! In other words we're good at hoovering up at the end of the day and will respect you and your home. Client relations are very important to us; we are polite and friendly to talk to, give impartial advice and free estimates. Please look no further for your loft-conversion, carpentry or general building quote. Call us today! We cover Sussex and Surrey; focusing on Horsham, Reigate, Brighton and the A23/A24 corridors.